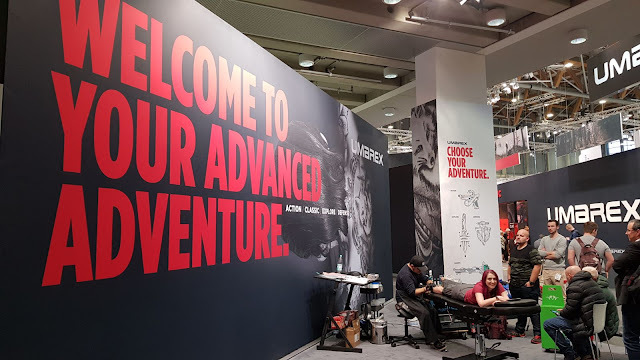 So this year at IWA 2018, Umarex had two tattoo artists setup in their hall (Hall 7A also dubbed 'Umarex Hall' as their stand takes up the majority of the hall) who were offering tattoos to show-goers. I had walked past the booth at least 6 times on my way to and from the press room on Friday and Saturday morning looking at the 4 different designs and being super tempted. On Saturday at lunchtime, I finally decided to pluck up enough courage to ask the artist exactly what the crack with these tattoos was and how I would go about getting one myself and he simply told me to turn up at the booth at 4.30pm ready so I went on a frantic search for a pair of trousers that both fit me (at a trade show that is no easy task where all the sample sizes are 34" waists!) and had enough room in them for me to roll up the leg as opposed to, either cutting my favourite skinny jeans or having no trousers on during the process (and a tight pair of trousers on over a fresh tatt afterwards) luckily, the guys at iWholesales very kindly let me borrow a pair of Emerson Gear trousers for the afternoon. I rocked up at 4.30pm with my trusty cameraman Liam and sat down to sign the form, and chat with the artist about the tatt. I chose the 'Classic' design but decided to omit the gas tube on the rifle. I then got up on the chair, got prepped and the work started. The tattoo took around 30 minutes, and during this time it felt like hundreds of people had walked by and stopped to see just exactly what the hell I was doing! 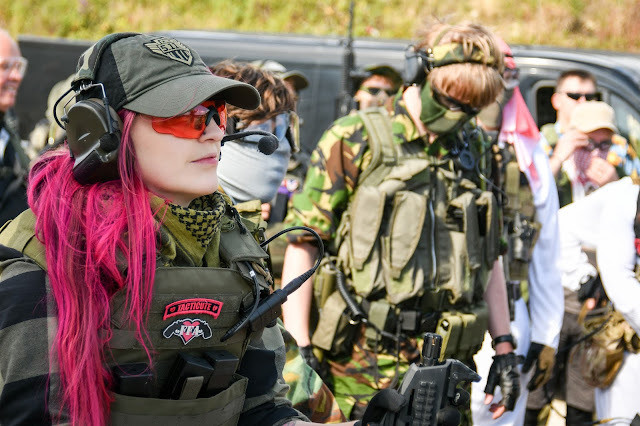 Amongst these, I had visits from friendly faces like Owen at Popular Airsoft, Rebelaxa and Rep Airsoft and Jonathan from Airsoftology. So why did I do it? There are a few things I love to collect on my travels - photos, stickers for my suitcase and memories! This is just a permanently etched memory. I have been asked 'what are you gonna do about that when you're 70?' 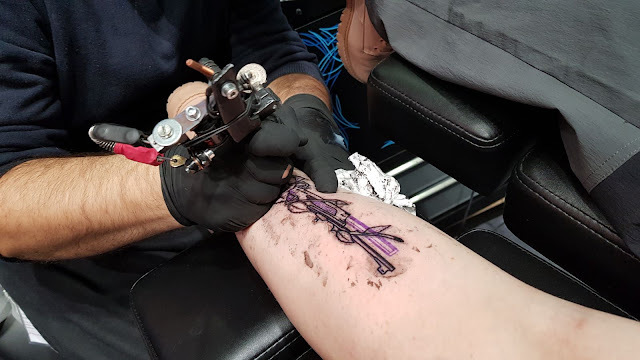 and the answer is: I'm going to look down at that tattoo, and remember the awesome weekend that I had at IWA 2018. Life is about experiences, and how many people can say they got a tattoo at a gun show in Germany? I also think it looks pretty dope!